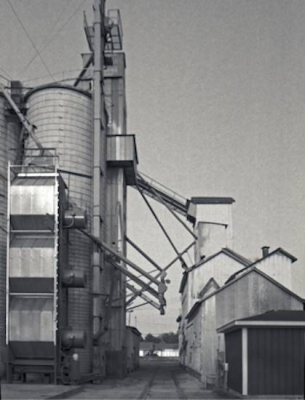 A feed mill in Grant Mill, Michigan. Photo by David Hanks. A mill in New Era, Michigan. A rare feature of the elevator at the Kellogg mills in Carson City is a set of spidery stairs, rather than a ladder, to the top of the elevator. 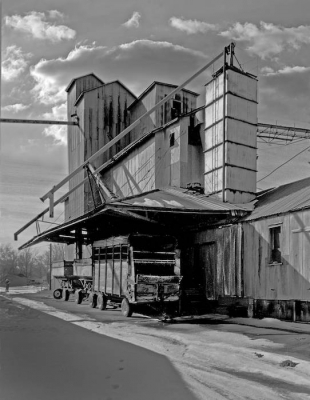 An 1875 feed mill in Grand Ledge, Michigan, with its replacement in the background. 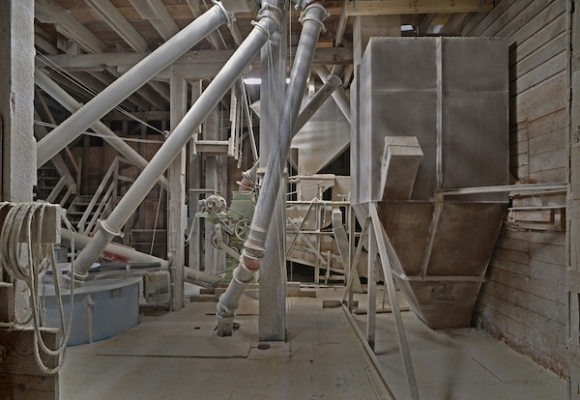 A contemporary grain mill in Sunfield, Michigan, built on the site of an older, smaller one. 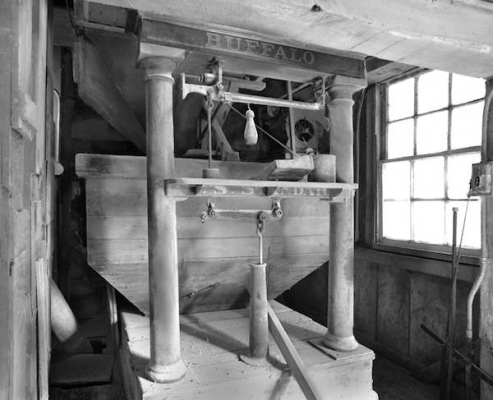 A scale used at a mill in Morrice, Michigan, that was used until the mill closed in the 2010s. The original wooden mill building in Moline, Michigan, built in 1881, can be seen in the center of the photo. It is now completely embedded in the steel structures and elevators surrounding it. 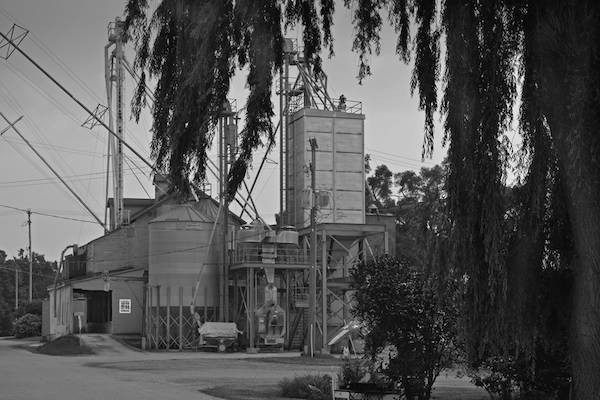 A feed mill in Woodland, Michigan. A mill in Lake Odessa, Michigan. Contemporary mill machinery in Moline, Michigan. A mill in Vickeryville, Michigan, which was closed down many years ago. 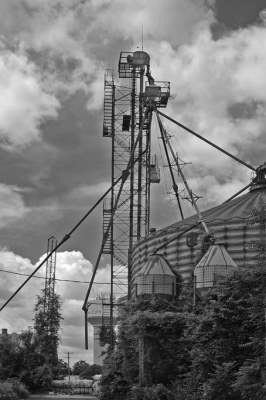 That’s the question I often get when I enter the office of a feed mill or grain elevator, asking permission to make photographs on the property or inside the buildings. Showing other photos that I’ve taken usually satisfies the operator that I’m not working for the local tax assessor or real estate agent, and I receive permission to proceed. 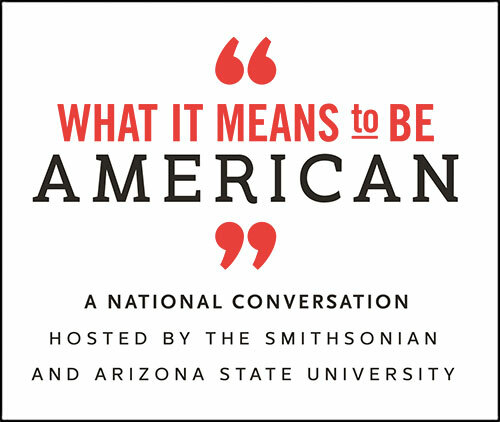 But it’s a good question: Why do I keep up with this activity? What is the motivation? There is no coherent explanation except to say that it is something I feel must be done. 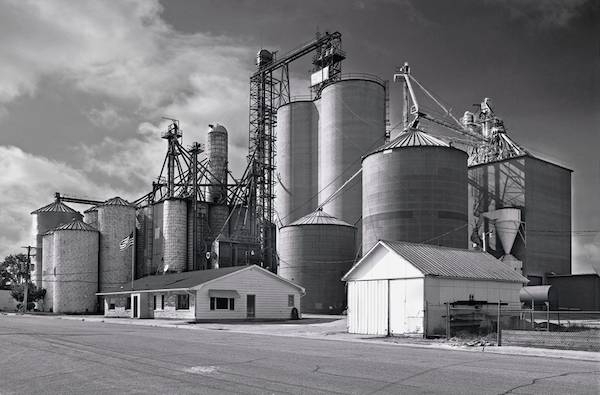 For more than 45 years, I’ve been taking pictures of feed mills and grain elevators in the towns of Michigan’s Lower Peninsula. 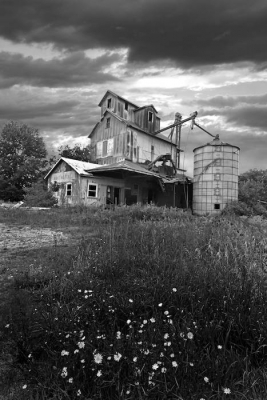 Here, the mills—plants that turn grain and other materials into food for farm animals—were once common enough to be taken for granted, even as they often provided a town landmark. Now, changes in the scale and economics of the agricultural industry have made smaller mills and elevators redundant or inefficient. 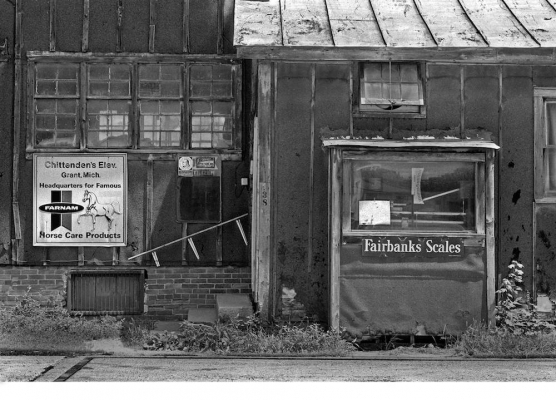 Some small town mills are still in operation—they might hang on by doing custom grinding (special mixes that depart from the standard recipe to treat particular conditions in animals), or selling lawn and garden products, or mixing for horses and other pets. One I visited even serves ostriches and llamas. But many smaller facilities have been replaced or engulfed by larger ones. Some have been torn down. Some have fallen into disrepair. A portion of history is slipping away. A few days later I drove back with camera gear. I now have thousands of images of feed mills and grain elevators. I came to know the workers at various places. 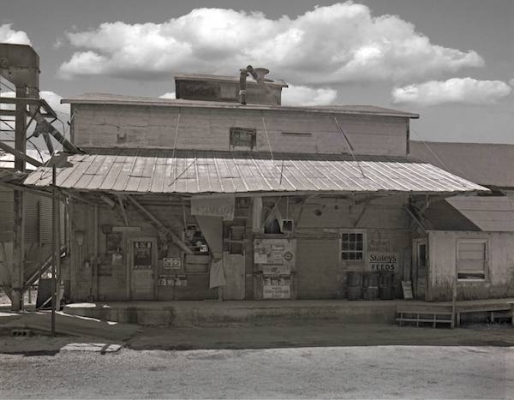 The owner-operator of a mill in Carson City still remembers when, just a boy, he left a tank of slow-moving molasses unattended, and it overflowed to coat everything—floors, machinery, stored feed. (He had to clean up the mess.) I’ve been told many tales, many as humorous as this one, but also some that bordered on the tragic. These include workers’ anxiety about a passing way of life, their resignation at changes, and their grief over accidents in mills and elevators—which are still more common than they should be. My photographer’s eye remains fascinated by the variety of the structures. They’re true examples of vernacular architecture. As they age and undergo repairs, they often acquire a mix of building materials. One section might include wood shiplap siding, wood clapboard siding, metal siding and a metal roof, corrugated steel, brick, tar paper, and even a car license plate used to patch a hole. What they don’t include is ornament or decoration. Except for the Christmas Stars. They are made on a framework of metal pipe with lightbulbs attached, mounted at the top of the tallest elevator. The lights are lit eight days before Christmas and are left on until New Year’s Eve. (I have asked a number of times about the reason for the eight days, and the only answer I’ve gotten is “custom.”) When I’m driving on an interstate in December, look out over the snow-covered farm fields, and see one of those stars glowing in the dark, I know that I am in the right place for me. I’ve photographed mills in every season, even in the rain and snow. I focus most on light. At times, I prefer the low raking angle of a winter sun, which accentuates the deeply engraved textures of an old building. At times, I prefer to photograph when clouds veil the sun to produce a misty cloak over a sharply detailed structure. I capture the pattern of dappled sunlight coming through tree leaves, or I open a door to let bright outdoor light spill across the floor inside. So many old mills have been waiting a long time for me to appreciate them. For my part, I’m only pointing. *All photos by David Hanks. David Hanks is a retired commercial photographer who now takes photographs as an avocation. 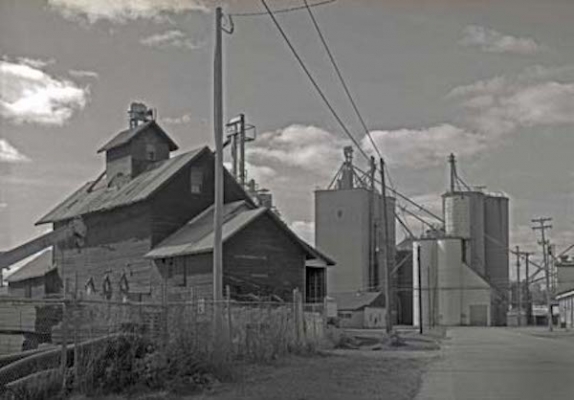 He is the author of Down By The Feed Mill: The Past and Present of America’s Feed Mills and Grain Elevators. Primary Editor: Siobhan Phillips. Secondary Editor: Eryn Brown.